B&H Photo Video is now taking pre-orders for a VR-centric LG G5 bundle that includes an unlocked phone, the LG 360 Cam, and the LG 360 VR. The bundle is priced at $749.99, which is a $300 discount compared to the usual retail price of the three included products. One way to look at this promotion is that B&H is offering both the VR headset and the 360-degree camera at just $100 for those who purchase the unlocked LG G5. A few weeks ago, before the official stateside launch of the new LG G5, B&H was the first retailer to reveal how much the two most important LG "G5" Friends accessories will cost. At the time, out feeling was that $199.99 a pop for the LG 360 VR headset and the LG 360 camera was a bit on the pricey side, seeing as both accessories and an unlocked LG G5 unit cumulatively cost about $1050. 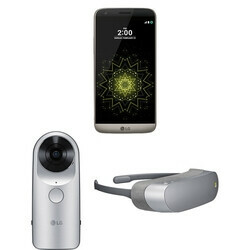 Obviously, the LG G5 bundle that B&H has now made available for pre-order, containing an unlocked LG G5, the LG 360 Cam, and the LG 360 VR is very attractive for those looking for the complete 360-degree LG G5 experience. We've already covered all of LG's 'Friends' accessories for the G5 in detail, but just in case you need a refresher, the LG 360 VR is a virtual reality headset (compatible with the LG G5) that uses its own display to render content, unlike the Samsung Gear VR products, which use the display of compatible smartphones. In the other corner, the LG 360 Camera, is a device which, as the name implies, can be used to capture 360-degree videos which can be rendered by any VR headset or device. Unfortunately, those interested in the B&H bundle for the LG G5 will have to wait until early May to get the devices in their hands. The SE rules at being a toy with its 4" dinky toy display. It's kind of funny that a touch screen display is the thing that rules everyone else's usage. It's also the window into the smartphone, so it is the most important part of a smartphone. The LG G5 has a 5.3" QHD display which is pushing more than 5 times the number of pixels compared to the dinky toy SE. Much better than getting the G5 with the fugly design and plastic build. The G5 has an all aluminum metal body. The antenna lines are hidden under a few coatings of paint on the G5. Plus you are getting a much better QHD display, dual cameras, an 8mp front facing camera, a modular design with a replaceable battery and expandable storage that starts at 32gb and not 16 gb like the iPhone 6s plus. There is even an extra camera grip with a 1200mha battery for the G5. This deal doesn't come close to the Galaxy S7/S7E BOGO deals that also offered Netflix subscriptions and Gear VR headsets. LG should offer more. The LG VR headset comes with the display and sensors built in, and uses a USB-C connector. The Samsung Gear VR headsets use the S7 as the display. Plus the S7 still uses micro USB. The G5 uses USB-C connector. Why would you even attempt to compare the HTC vive to a mobile device? The HTC vive and full Oculus Rift require beefy PCs with really good graphics cards, plus you have other things to setup in the room for the vive. Now the Gear VR is a mobile competitor to LG's VR headset. The LG headset is much lighter on a users face and sits just like a pair of glasses. The other thing is since it uses USB-C to receive the images and sends the sensor data. This headset can be used on any other device that supports USB-C type devices as well. The Gear VR only works with some Samsung devices only and supports slow micro USB. Also you get better viewing controls with LG's to control the viewing lenses. Clearly you never used LG's headset. or you can get an HTC 10 for $100 more with no accessories.